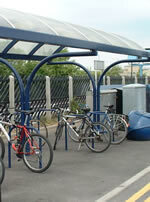 The Hub: For a fail safe secure solution to cycle parking, don’t forget the Hub in Stockton Town Centre. We have FREE indoor parking facilities from 7:30am – 5:30pm Monday to Friday. Wheel support rack: These should be avoided as they do not allow the bike frame to be locked easily and can lead to damage of the front wheel. Sheffield Stands: These support a bike well and allow both wheels and the frame to be locked easily. Compound: Some larger schools and Durham University have a secure cycle compound where bikes can be locked to Sheffield stands and then locked within the compound throughout the day. This stops bikes being ‘fiddled’ with! 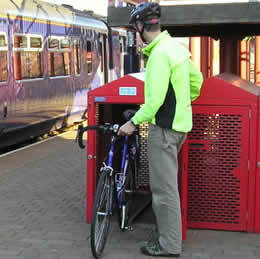 Lockers: Lockers are the most secure form of storage as it encloses the entire bike.